If you are a compassionate and creative individual who is looking for a rewarding opportunity to help people, then a career as an Occupational/Physical Therapist Assistant may be just what you’re looking for. With this combined diploma, you may work as an Occupational Therapist Assistant (OTA), or a Physical Therapist Assistant (PTA). This program is offered both at the Medicine Hat Campus and online via distributed learning. The Occupational Therapist Assistant/Physical Therapist Assistant (OTA/PTA) career is aimed at improving patient/clients’ health, movement, and quality of life. As an OTA/PTA, you will work under the direction of Occupational Therapists (OT) to help clients successfully perform daily activities related to self-care, leisure, and work, school or play. You will also work under the direction of physiotherapists (PT) to help provide treatment to help patients recover from illness or injury to improve patient mobility, relieve pain, and prevent or lessen physical limitations. If you are a compassionate and creative individual who enjoys working with people and being part of the health care and rehabilitation team, this program may be a good fit for you. Working with clients of all ages ranging from infants to seniors with a variety of health conditions, you will learn how to use a variety of interventions to help your clients. The activities could range from games or crafts; group activities; exercise for strength, flexibility, balance and coordination; use of assistive devices, and various electrotherapy and physical modalities. Your clients might have conditions such as back pain, arthritis, heart disease, stroke, cerebral palsy, autism, mental health disorders or dementia among others. An OTA/PTA’s responsibilities also include monitoring and recording client progress, and reporting to the OT or PT. This program is flexible in that the first 10 courses are common to both the OTA/PTA and SLP Assistant (SLPA) diplomas. This unique approach provides students with an excellent core upon which to build more specific skills depending on their interests. Along with extensive classroom training, students experience practicum training with potential employers in hospitals, private clinics, home care settings, schools, and community programs. The diploma is offered both on-site (at Medicine Hat College) or via distributed learning. The on-site option is a two-year (five semester) diploma program, whereas the distributed learning (DL) option is completed over a longer period of up to five years. Students may wish to continue on and complete the SLPA diploma after completion of the OTA/PTA diploma. This diploma will also transfer to degree programs. ELA 30-1, or or ENGL 1XX and Biology 30 or equivalent are required. This route is applicable if you do not meet the minimum requirements for admission but possess other post secondary and/or work experiences that create potential for success in the program. This route is available to a limited number of students. If you have previously attended a recognized college or university, you may be accepted on the basis of your college or university level course work. You must have completed at lease 15 credits of coursework with a minimum grade of or GPA of 2.0 out of 4.0. You must have a 60% in ENGL 30-1 or equivalent of a C grade in a university level English course. You must have a 60% in Biology 30 or equivalent of a C grade in a university level lab science course. Some courses related to this program are found here. Please see the academic calendar or this year's program planning guide for an up-to-date set of courses related to Occupational /Physical Therapist Assistant. 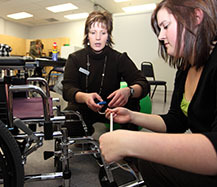 The Occupational/Physical Therapy Assistant program at Medicine Hat College has been accredited by the Occupational Therapist Assistant and Physiotherapist Assistant Education Accreditation Program (OTA & PTA EAP) in collaboration with Physiotherapy Education Accreditation Canada (PEAC) and the Canadian Association of Occupational Therapists (CAOT). The status of Accreditation was granted to the program on April 30, 2015 for the period until April 30, 2021. The OTA & PTA EAP contact information is: Occupational Therapist Assistant and Physiotherapist Assistant Education Accreditation Program, Suite 26, 509 Commissioners Road West, London, Ontario, N6J 1Y5, (226) 636-0632, www.otapta.ca. All program requirements must be completed appropriately and satisfactorily prior to commencing fieldwork. (TAPC 110, TAPC 111, TAPC 113, OCTA 217, PHTA 217, and OPTA 217). Fieldwork arrangements are made by Medicine Hat College with consideration of student preferences; however, students may be required to complete fieldwork at sites other than those requested by students. Once arrangements are confirmed, they are usually not modified. Students should expect to complete at least one fieldwork placement out of Medicine Hat (fieldwork courses are OCTA 217, OPTA 217, PHTA 217, TAPC 110). You may anticipate additional costs associated with these placements, e.g., travel, accommodations, etc. At this time, fieldwork placements occur only in Canada. Fieldwork placements in OCTA 217, OPTA 217, and PHTA 217 are full-time placements unless otherwise approved by the coordinator and fieldwork sites. Immunizations required by the program must be up to date prior to commencing job shadowing and fieldwork placement(s). You must successfully complete lab examinations in OCTA 215, OCTA 216, OPTA 212, PHTA 215, and PHTA 216 prior to entering fieldwork. All fieldwork experience must meet attendance requirements as specified. Participation in all activities related to fieldwork is mandatory. Should you receive an unsatisfactory evaluation on a fieldwork placement, you will be required to discuss this situation with the Medicine Hat College faculty. This evaluation may result in your having to repeat the placement. If you receive an unsatisfactory evaluation in more than one placement, you will be required to withdraw from the program. You may be required to obtain a recent police information check and/or similar checks, at your expense, prior to entry into some fieldwork sites. You may wish to discuss this further with the Coordinator. Should your performance and/or health be questionable in relation to the delivery of safe client care and/or the maintenance of the professional standards of the program, you may be asked to leave your fieldwork site and may not receive credit in the fieldwork course. If you have been employed in the field prior to entering this program, you may be eligible for prior learning assessment. Please contact the Coordinator for further information. If you are enrolled in the distributed learning component you are expected to participate in experiential learning opportunities that are group or individually based. You should be prepared to travel to pre-arranged sites for lab workshops in OPTA 212, OCTA 215, OCTA 216, PHTA 215, and PHTA 216. You must normally complete all courses in each group prior to beginning courses in subsequent groups. Programs completed otherwise will require submission of Prerequisite Waiver forms. Tuition and other fees are charged on a course by course basis; textbooks and supplies are additional.